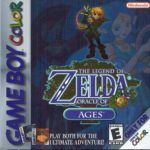 The Legend of Zelda: Phantom Hourglass (AKA ゼルダの伝説 夢幻の砂時計 Zeruda no Densetsu Mugen no Sunadokei in Japan) is a 3D action-adventure role-playing game (RPG) developed and published by Nintendo for its NDS handheld console. 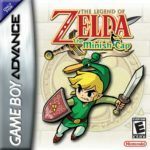 It is the fourteenth installment in The Legend of Zelda series and the sequel to The Wind Waker, featuring the same surrounding world and art style. It is also very fun and easy to play, just like the older Zelda games. This game was followed by The Legend of Zelda: Spirit Tracks in 2009. The Legend of Zelda: Phantom Hourglass is classified into two types of gameplays. The first one is sailing from island to island while the other is exploring those islands and facing their dungeons. You control Link throughout the game. He discovers and uses different items like a classic boomerang, bombs and bow. While sailing, a map shows on the screen and a 3D view of Link with the nearby surroundings on the bottom. Phantom Hourglass can be played solo or with your friend. In the one-on-one multiplayer mode, you play as Link while your friend will control the 3 Phantom Guardians. The storyline of The Legend of Zelda: Phantom Hourglass starts almost right where its immediate predecessor, The Wind Waker, ended. Link, the main protagonist of the series, is sailing with his pirate crew to search for a ghost ship rumored to have tons of treasure. When the ghost ship appears, one of Link’s pals, Tetra, jumps off to search it and then a scream follows. The ghost ship is full of horror and mystery as it makes people disappear. The ship appears and Tetra jumps into it to look for the treasure. Unluckily, she screamed, and the ship leaves into a grove of fog. Link jumps after it but he sank and the water brought him on the coast of a colonized island. It shows how Link’s items and abilities vanished, though Phantom Hourglass follows the story of Wind Waker. Ready to play The Legend of Zelda: Phantom Hourglass online? The Legend of Zelda: Phantom Hourglass goes with dungeons, appealing boss titles and tricky puzzles. Likewise, it’s different from the previous Zelda games because of its exclusive touchscreen-based control system. Phantom Hourglass involves simple moves such as tapping and swiping of the stylus. It has everything you want, from traditional puzzles and matches to new, specialized functions. All these things bring more excitement to players. Further, the developer simplified the game’s control mechanics for a hassle-free gaming experience using Nintendo DS. The character will move if you hold and tug the stylus to where you want him to go. Tap the enemy to stab him or kill him with a wider rip by swiping the screen faster. You can also draw some loops around the game’s character for a powerful spin attack. The Legend of Zelda: Phantom Hourglass has been ported to NDS, and Nintendo Virtual Console (Wii).